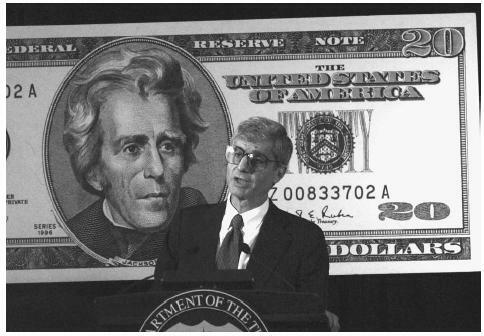 Treasury Secretary Robert Rubin holds a 1998 press confernce to announce the release of a new $20 bill, redesigned to include features that make it more difficult to counterfeit. Anti-counterfeit features will be enhanced every seven to ten years, and will include subtle color changes. U.S. Department of the Treasury Department< http://www.ustreas.gov > (April 18, 2003).